With the dramatic gain in popularity of wood floors in recent years, more and more consumers are turning to cleaning professionals for maintenance advice and services. Following are six of the most frequently asked questions and answers about hardwood floor cleaning. 1. Do different types of wood grains affect the cleaning of hardwood floors? Absolutely. A lot of the wood floors you see today are different than what you would typically find in your mother’s or grandmother’s home. They no longer are all one color, with a smooth, elegant finish, but often contain visible character marks such as knots, checks or splits. Some are even hand-scraped to give them the old rustic look. This is called open, rustic or character grain. 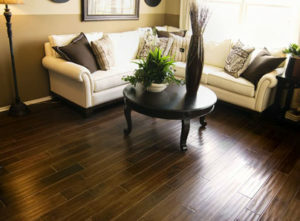 When you look at this type of hardwood floor, the grain is open and actually contains gaps to give it that rustic look. Because of these open separations, these floors need to be cleaned and maintained differently. Cleaning products and moisture can accumulate in these separations which can permanently damage the floor. 2. Do wood floors have different finishes? If so, will that affect how they are cleaned? 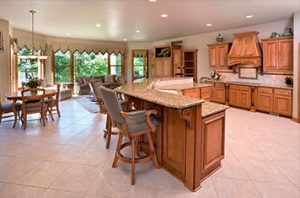 This is perhaps one of the most important factors when it comes to cleaning hardwood floors. Depending on the manufacturer, each floor has different finish characteristics and will need a different cleaning product or system to properly maintain that finish. If the wrong type of cleaner is used, for example, one that contains a hard wax oil finish, it could potentially ruin the floor and cause it to need to be totally refinished. 3. How would I know what cleaning product to use on which type of hardwood floor? You should always defer to the manufacturer guidelines and never assume what type of floor finish is on the hardwood floor, as it is often impossible to tell. This is especially true when it comes to hard wax oil finishes. Because each manufacturer develops its own finish system and its own proprietary cleaning/maintenance formulas, you will need to use a product-specific system to ensure lasting beauty of the wood floor. If the wrong cleaning system is used, you may end up permanently damaging the floor. This causes headaches for cleaning professionals because there are a large variety of hardwood floor cleaning products marketed to consumers at retail stores. Any consumer can walk into a supermarket and select from an aisle of hardwood floorcare products. This seems great for the consumer, but in reality those products are typically not good for most hardwood floors. 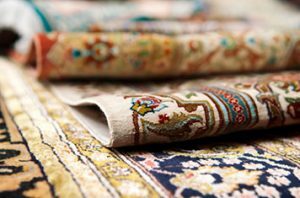 If I were to come into someone’s home and clean their carpet using a low-quality, high-residue cleaning product, I’d leave behind harmful residues. Similarly for generic floor cleaners which can leave harmful deposits (waxes, silicones, etc.) behind. A lot of the off-the-shelf cleaners also contain different types of polishes to enhance the sheen and improve the appearance of your wood floor. The problem is, these “cleaners” then bond and permeate into the floor finish, so the next time you apply a maintenance coat of floor finish, it may not bond properly. In that case, it will end up peeling off like old paint on a house. 4. When cleaning hardwood floors, what are the most effective cleaning products? An effective and product-specific cleaning solution, a spray bottle and a cloth is typically all you need. A good rule of thumb for the quantity of floor cleaner is one quart of cleaning product for every 500 square feet of flooring. Although, if your floor is one with a rustic or character grain, you will want to use even less as the cleaning product tends to accumulate into the checks and cracks in the grain. There’s been a big push in the market for steam cleaner/mops. These can permanently damage wood floors. Almost all prefinished flooring manufacturers state within their floor care instructions that steam cleaners will void the finish warranty. This also applies to the use of auto-scrubbers. These machines use substantially more water than the 500 square feet per quart many manufactures recommend. It’s vitally important to comply with manufactures floor care instructions to ensure optimal results and maintain the warranty. 5. What type of cloth do you recommend cleaning wood floors with? Terry cloth works well but the best type of cloth for cleaning hardwood floors, no matter what the grain type or finish, is microfiber. Whether it’s a cloth or a mop, microfiber is the best choice. It doesn’t leave excess moisture behind and picks up lint and pet hair very well. 6. What is a common misconception about hardwood floor cleaning? One of the biggest misconceptions is that one can simply use water to clean a hardwood floor. Water won’t break down dirt/soil, grease, body oils that eventually accumulate on your floors. I had a customer who would put lotion on her feet before bed every night. During the night she’d get up to get some water. Over time, there was a buildup of lotion on her wood floors that she couldn’t get rid of because she only used water to clean her wood floors. We ended up cleaning her floor with an environmentally friendly, low-VOC cleaner and were able to get her floors looking like new again. Roy Reichow has 40+ years of experience in the wood flooring industry as a flooring contractor. He holds National Wood Flooring Association Certified Professionals (NWF ACP) certifications in installation, sanding and finishing, sales counselor, inspector and commercial inspector. He also served as past chairman for the NWF ACP as well as on the NWF ACP Board of Directors and Marketing Committee. He has conducted investigations for wood flooring distributors, contractors, home builders, manufacturers, attorneys, homeowners and insurance companies. He works with leading wood floor manufacturers to review and revise their installation and warranty guidelines. Reichow also leads educational seminars for wood floor professionals and is a speaker at various conventions and home improvement events.